(Newser) – So will the week end with a Capitol Hill deal to reopen the government and avoid a default, or at least set the stage for a weekend breakthrough? Signs of progress remain promising, but as Politico puts it, "there’s no one dancing in the West Wing end zone" just yet. For one thing, any such deal—a short-term increase of the debt ceiling, maybe?—could fall apart in a flash. For another, a White House celebration could trigger a self-defeating backlash before the deal is finalized. A key point today will come about 11am, when President Obama hosts Senate Republicans, reports the Washington Post. Don't you know how it works ? We spend ourselves into becoming millionaires (Or what ever) When we are all millionaires we don't have to pay it back because we owe it to ourselves !!! Get it ? The Senate chose not to vote to authorize that money to be spent, because it did not include money for the ACA. The Senate says that it wants a "clean" bill from the House of Representatives, andsome in the media keep repeating the word "clean". But what is unclean about not giving the Senate everything it wants? Did not the Pres. 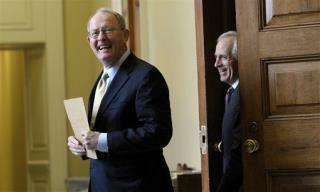 as a Senator vote against the increse in the debt limit ? Just asking !! Or is the Pres. a YOYO and changes positions as the wind blows ? Is the "shakedown", I mean shutdown, still going? I, personally, have seen absolutely ZERO difference from when they were "supposedly" working. Maybe it should continue for a few weeks.